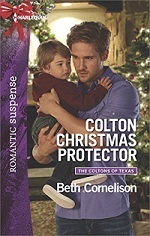 elcome to romantic suspense author Beth Cornelison's home page. When my first Silhouette Intimate Moments novel hit the shelves in April 2005, I realized a long held dream of publication. I hope you'll check back often to see the new directions this dream takes me- book signings, speaking engagements, new releases, and special memories with friends and family. Be sure to check out the Lagniappe page for lots of extras... including articles on writing, listings of my book signings and speaking appearances, links to my favorite websites, and recipes that reflect the culture of Louisiana or are a personal favorite treat. Also on the Lagniappe page, you'll find the link to enter my latest contest where you could win books and other goodies! The Mcall's are coming! I know it has been a while since I had a book out, and that is because I've been working on a three-book trilogy for Harlequin Romantic Suspense that will be released in Fall of 2018. I'm super excited about this series and can't wait for you to meet the McCall family of the Double M Ranch. When a saboteur attacks the McCall family ranch in Boyd Valley, Colorado, the McCall triplets--savvy Piper, dare-devil Josh, and brooding Zane--find danger, adventure and romance as they attempt to save the family from financial ruin. The siblings make plans to open a new business that combines adrenaline sports with a touch of ranch life, hoping to bring in new revenue to save the family ranch. But when the vandal's attacks grow bolder and more desperate, the McCalls fear not only for the future of the ranch, but also for their lives! Go confidently in the direction of your dreams; live the life you've imagined.